Like probably everyone, or at least every food blogger, in the world with an oven and a fondness for baking bread, I tried the No Knead Bread as written up in the New York Times in November. Authored by Mark Bittman via Jim Lahey of Sullivan Street Bakery in New York, this almost perplexingly easy method of mixing up a bread dough that has that distinctive 'artisanal bread' crumb and thin, crackly crust caused a sensation in the teapot that is the world of food blogging. As just about everyone says, it does produce a very good bread. And yet...for me it lacked that something extra special. This has a lot to do with the fact that in this country good bread is quite easy to get. Even the bread sold at the major supermarkets is not bad at all. The rather shiny, slightly gummy, open-grained texture of the No Knead Bread reminded me of pain paillase, a very popular twisted loaf bread that's widely sold in Swiss bakeries. The thing is though, pain paillase, being a pain au levain (a sort of sourdough) and baked into a fat baguette shape, is tastier than the all-white flour No Knead Bread. So, I haven't baked any basic No Knead since the first couple of loaves. Besides. I'm trying to cut out white flour at the moment. The technique itself is so easy that my thoughts turned to adapting it to my favorite homebaked bread, desem. Desem bread is the first long-term project that I wrote up in a series of articles on this site 3 years ago. It's still the most interesting all-whole wheat bread that I've eaten, being so much lighter than most all-whole wheat breads, yet chewy, complex and substantial. The one drawback to desem bread is that the original recipe as calls for it to be kneaded for a very, very long time, with lots of muscle. In The Laurel's Kitchen Bread Book where the recipe with long, extremely detailed instructions appeared, they call for kneading it for 20 minutes. I don't now about you, but I don't really have the time or patience to be kneading bread for 20 minutes once or more a week, even if desem bread is so good that I crave it when I don't have a loaf around. So, since December when I stopped making white-flour No Knead, I've been experimenting with no-knead desem. It wasn't as easy as I thought: the first time the bread flopped miserably in the ultra-heated Le Creuset pan and never recovered; the second time the bread was so wet that half of it remained stuck in gooey mess on the towel; and so on. But the last few times it's worked quite well. The bread rises very nicely, the crumb is light and open yet has that 'artisanal kneaded for hours' texture, and the crust is crisp and crackly. And, that slightly sour, distinctive desem flavor is still there. You do need to start out with a fully mature desem - an immature desem won't have the leavening power. Please follow the desem steps from day 0 if you've never given this a try. It will be worth it provided you can give it all of the right conditions. Submitted by maki on 2007-02-07 19:01.
hi maki! apparently my favourite food bloggers are non-bread bakers, as this is the first i've heard about this no-knead bread. frankly, my favourite part of bread baking is the kneading part. i've even abandoned the richard bertinet very light kneading method in favour of a good old fashioned pound and whack. what is it that makes the no-knead bread so special (besides the obvious)? my body can no longer tolerate large amounts of white flour (or white sugar), and it sounds like adapting the no-knead method to anything more wholegrain would take more time than just a good whackadough session. Hi Santos. I would recommend you try the original no-knead bread from the NY Times at least once (first link in the post above) ...it does produce a very, very nice bread with a real 'kneaded for a long time' open, shiny texture that you might get from a real pain levain, and a thin crackly crust. The points to the no-knead method are - a very wet dough, that's just a bit stiffer than a batter, that's allowed to ferment for a very long time (12 hours or more), letting the yeast do the work rather than the baker; and the baking in the cast iron or ceramic oven-ready container with lid (e.g. a Le Creuset or similar pot) at a high temperature, which gives it that crispy-crackly crust. It does make making a sort of good everyday European-style loaf damned easy. The drawback is that you can only get one kind of loaf - a big cottage-loaf shape that is the shape of whatever pot you bake it in. It doesn't allow for any other kind of shaping. I'm trying to cut out white bread as much as possible like you, so I've experimented a lot with adapting the method to the whole wheat desem as described. I like kneading sometimes too, but original desem dough wants a long, long kneading...which can get tedious since we bake this bread at least once a week on average! 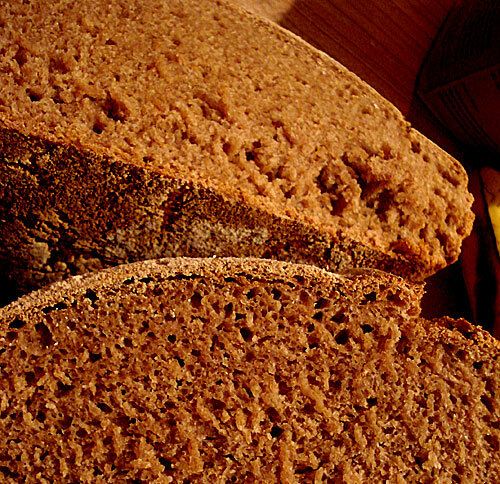 I've read reports around of people adapting the no-knead method to regular whole wheat bread with good results too. (try googling no knead bread...tons of results come up). I do still make other breads that are in other shapes with good old kneading though, especially a traditional Swiss zopf (braided bread) which really does require that whack and stretch method. my goodness, where have i been?! every food blogger has tried it. it isn't much different than the traditional european ideas about bread; it's just adapted to the modern kitchen. i guess i'll try it eventually; somehow it just doesn't excite me the way your desem recipe does. Desem bread really is the one bread that is endlessly fascinating to make for me...because the whole process is so interesting: the fact that it's only made from three ingredients - whole wheat flour, water, and salt - leavened with natural yeast, feels so fundamental and like...ancient or something. I do hope you give it a try! I guess no-knead caused such a stir because it is so very easy. Also it's hard to get this kind of artisanal-European style bread I guess in much of the U.S.
At Wal-Mart I bought 2 Anchor Hocking heavy glass bread pans (I like to double the Jim Lahey recipe and make 2 loaves). The Anchor Hocking website shows covers, but none at Wal-Mart. I used aluminum foil. They work well to make nice loaves. To get covers I probably should buy bakeware such as shown on King Arthur Flour website. Anxious to try the desem sourdough bread. Don’t know whether to do my own starter per Laurel’s instructions, or buy King Arthur’s. Any advice? Desem starter is nothing like any other sourdough starter, so to get desem you do need to go through all the steps detailed int the Laurel's Kitchen book. It is tedious, but it's worth it!